A label can be added to any desired content area to have a more specific layout. 3. Click Add an a activity or resource. PLEASE NOTE: There are two different ways to complete the next step depending on which view you are in. If you see two separate drop-down boxes, click Add a resource and select Label. For more information about this option, view Activity Chooser Option. 4. From the list of options, choose Label and click Add. 5. Enter the desired text you would like in the label in Label Text Area. 6. 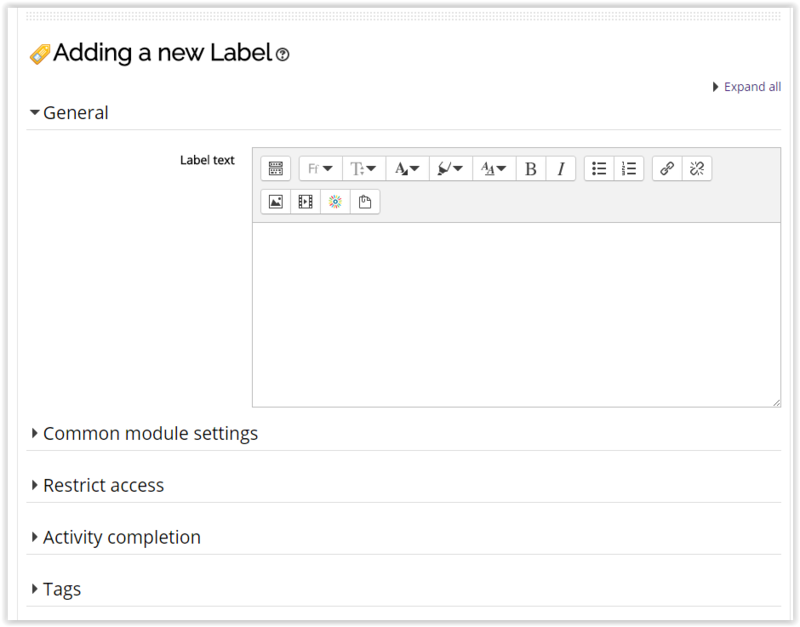 To make the label visible under Common Module Settings, click the drop down menu of Available to students and select Hide or Show. 7. Next, you can edit any restricted access permissions and the activity completion settings. 8. Personalize the label in the Label Settings. 9. When finished, click Save and return to course and the label should show up under your week/topic content area.